Deutsch: Diskriminierung über Claudia Omoroghomwan als Vogtlandkreis bestraft Nigerianische Mutter und ihre 5 Kinder. We call for Solidarity and Court Process in Auerbach Parkstrasse 1, Room 302 on 25.08.10 at 13Uhr. Ms. Claudia Omoroghomwan continues to face injustice in Vogt land district more than two years after exposing the injustice perpetrated by district Officials against herself, 20months old Son, 9 years old Daughter she rescued from Abuse and Kids of her late Brother she was obliged to take care of. The whole manipulation is instigated by the Youth welfare Office intentions to take the kids from her by any possible means. That has remained an unanswered question thrown by Mrs. Claudia Omoroghomwan to an Activist of The Voice Refugee Forum during an investigation mission to Vogt land District in July 2010. The injustice is clearly expressed by the District denial of her residence Right with the excuse that she has a pending criminal proceeding falsely leveled against her by the Youth welfare Office. The investigating Activist witnessed this pronouncement as he accompanied her to the foreign Office in Reichenbach. According to him, Ms Claudia Omoroghomwan is been condemned before Charged guilty. The Youth welfare Office accused her of attempted kidnap of her Nephew. The same young boy they forcefully took away from her in 2005 with claims that she had no secured residence Right. The same Youth department is now framing an entirely different Story to facilitate their continuous Custodian for the little boy. 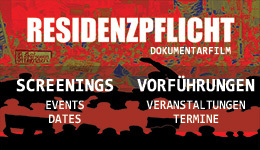 We call for Solidarity and Observation in the Court Process in Auerbach, Parkstrasse 1, Room 302 on 25.08.10 at 13Uhr. This injustice is in the bid to destroy the life of her entire family. The Children are daily confronted with mental-Physical Trauma and demotions that greatly hinder their Social and Educational development as after effect of their being dumped in the Jungle Lager in Posseck from 2006-2008 and deprived from going to School for years. Although the kids are attending schools now, further education for them is not supported. Their wishes to continue in grammar school (Gymnasium) are being denied as well as their Social welfare development through the Youth welfare Department hindrances. Ms. Claudia Omoroghomwan sees herself being used by the Youth welfare department. She complains of short comings in the support for the Kids development. She also expresses the Custodian-Hr Winkelman threat of coming to pick up the kids anytime she complains of their lacks. This pressure is directed at creating the opportunity to brand her as incapable to take care of the kids. The Youth welfare Department tries to makes the Kids feel insecure living with her just as they planted in the minds of her Nephew who feels disappointed that she couldnâ€™t protect him. Also the Police brutalization of the Kids in 2008 (3) has remained a continuous threat against the family. This time, Sandra (15 years) was picked up from bed at about 8AM in April 2010, detained in the police Cell until her court appointment for 2PM and brought to Court in Handcuffs without regard to Ms Claudia Omoroghomwan whom the Kids are living with. One could also see the whole bureaucratic misuse of powers exercised by the district Officials just to provoke one to resistance that gives room for them to frame criminalities. According to Ms. Claudia Omoroghomwan, quite a number of Officials who noticed the mistreatment and abnormalities at certain times attempted helping out only to change their position as soon as they speak with the appropriate Officer in Charge. According to Ms Claudia Omoroghomwan, I understand the game and could see that feeling of helplessness in their faces. Ms Claudia Omoroghomwan is denied of virtually everything she asks for the Children development. She bitterly expressed the hatred from the District Authorities on her Family. She says, I am so confused that I no more know what to ask for and even who to speak with in the Offices. I have been left with the only option to borrow and beg to meet their basic comfort which was supposed to be the duty of their Custodian (Vormund) to monitor. I could not continuously stand their Teachers complains about the kids abnormal dressing because the Youth department offered no Washing Machine and other necessary domestic items. The children sleep with their mattress on the Floor up till date. They have no opportunity for school group excursions, except I would have to borrow to make it possible. Every member of Family Omoroghomwan has a strange and bitter story to tell up to this very moment. “Mama, we are tired of staying in this district! Do you mean we are going to remain here after the Holiday? That was the cry of the Kids during the last week before School resumed. Mrs. Claudia Omoroghomwan has consistently stood against the Abuses of the District against her and the children especially. The Kids have pledged continuous support to her resistance against the mistreatment imposed on them in the District. They also confirmed the awareness that the whole struggle from their Aunty was ultimately for their sound developments. We therefore call for financial support for Family Omoroghomwan. 2. Why the Custodian have refused to exercise his full responsibility. 4. Full opportunity to public and social welfare without discrimination and control. 5. Freedom to reside anywhere like any German. Kelvin Abubakar is a Nigerian born to the family of Mr Omoruyi Omoroghomwan from Benin City in Nigeria. He was given out at a very tender age to a foster parent living in the northern part of Nigeria. He left Nigeria in 2003 and applied for Asylum in Germany. The Federal Office of Migration and Refugees accepted his application on Humanitarian Ground based on his critical health situation that was undetectable in Nigeria. His survival boils down to the Aunt’s interest to take care of him after the death of his Biological parents in a fatal motor accident in 2001. Kelvin fell very ill that the foster parents gave up hope for his survival based on Doctors claimed to have diagnosed incurable full blown Tuberculosis. Ms Omoroghomwan picked Kelvin up to Lagos where various medical measures were applied to save him but not successful. She decided the option of taking him to Germany where she had guaranteed medical attention. During this period of trying to save Kelvin in Lagos, Frau Omoroghomwan Biological daughter (whose father resided legally in German) and the 3 daughters of her late brother (Kelvin’s Sisters) were faced with the problem of female genital abuse that prompted the necessity to take them all out of Nigeria. While delay in the Travel Documentation Process persisted, Kelvin’s unbearable Health situation continued to worsen. Ms Omoroghomwan had no option but to find an urgent possibility to take Kelvin out of Nigeria. By coincidence, Kelvin’s foster Sister Sandra Abubakar was concluding preparation to leave Nigeria for Germany in search of the father of the Child she was carrying in pregnancy. Ms Omoroghomwan then handed Kelvin over to Sandra to take along with her to Germany. In 2005, Kelvin was forcefully picked up from Ms Omoroghomwan at the Asylum Lager in Reichenbach with the Police.The Police ignored the cries of the young Kelvin and his Aunty at the presence of representatives from the Foreign Office and the Youth department who watched actualized their Plans. The youth department later claimed that Kelvin had to be taken away because Ms Omoroghomwan had no secured Residence right (so called Duldung) at that point in time. All the same, Ms Omoroghomwan was allowed to visit Kelvin at her wish in the Reichenbach Children Hostel. In 2007, she also visited him in company with the Sisters (Sofia, Sandra and Sonia) who had already arrived Germany. Kelvin had during my visits cried and expressed his willingness to live with me rather than in the Hostel. The little Kelvin could not really understand my position in the Eyes of the German Law “as Ms Omoroghomwan explained”. Kelvin had always trusted me as that Aunty who could make everything possible but could not imagine why the Police could take him away from me just like that. She explained further, I could not see myself telling the whole story of Germany to the Young boy, instead I had to keep consoling him with promises of coming to take him back Home soonest. Kelvin would not understand the game of the Authorities to have sent her and the family to live in to the Jungle asylum lager in Possec where they had to face difficulties to visit Kelvin even on his Birthday. During those times in Possec, even calls to make an appointment to visit Kelvin were meted with excuses from the Officials in the Hostel. Injustice on Family Omoroghomwan was intensified by the Authorities. We couldn’t cope with seeing Kelvin’s Pains on one hand and the District Officials continuous intention to destroy us on the other hand. It was just too much for me lamented Ms Omoroghomwan. A bridge between her and Kelvin was successfully created. There was no opportunity to visit him until 2009 after they got the residence right that permitted their moving out of Possec in 2008. Ms Omoroghomwan explains that their visit to Kelvin in 2009 unraveled the entire game of the Authorities more clearly. Even an Employee responsible for Kelvin altered the comment that some Persons would have to loose their Job if Kelvin has to leave the Hostel. This is my only Crime against Vogt land District that has brought my Family all these injustice from virtually all the departments. The whole pressure is to frustrate and destroy my family according to Ms Omoroghomwan.